Posted on April 17, 2012	by Michael Gorton, Jr.
Clovis Point is slowly gaining some attention. Their reds have captured my attention since I first visited them on a beautiful summer day back in 2005. They may be under the radar for some, which is a shame. They should be a must visit for everyone who goes out wine tasting on the North Fork. A boutique winery in Jamesport makes some delicious chardonnay, bot steel and barrel fermented and some distinctive Merlot, Cabernet Franc and Cabernet Sauvignon and a red blend from grapes grown on the estate with a delicious Syrah that is usually hard to come by. All made under the direction of winemaker John Leo. 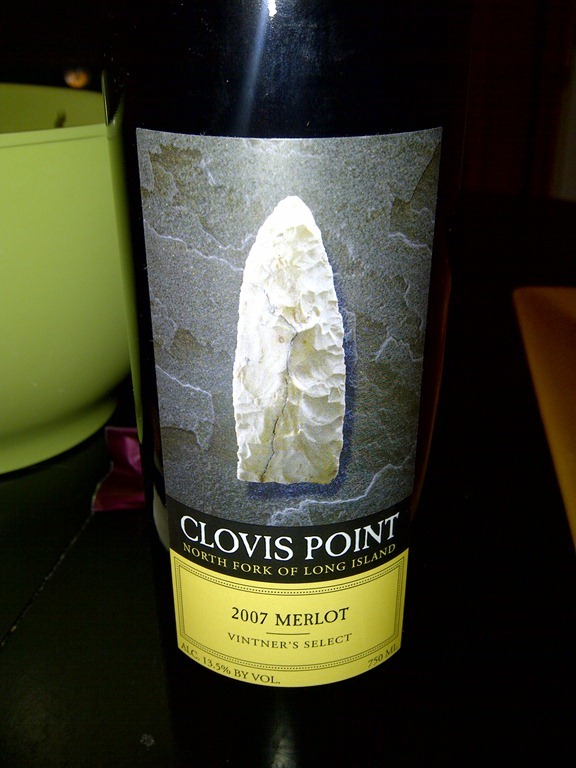 Clovis Point 2007 Vintner’s Select Merlot ($35) is only made when the winemaker feels that the grapes harvested warrant this special designation. 2007 was a great vintage on Long Island so it was a no brainer to make a Vintner’s Select that year. The nose bring ripe concentrated mélange of berries and fruit. Plum leads the way with blackberry, raspberry and blueberry in the back ground. Cherry and pomegranate appear in-between warm spice notes of clove, nutmeg and coriander. Black pepper and fresh bay leaf come in secondary with things of fresh roasted espresso and smoky cedar and cigar box aroma. The palate brings a burst of ripe berry bramble. Plum, blueberry, black berry and cherry lead the way with some notes of earth, mineral and more ground coffee. Sweet vanilla bean and cedar hidden in the back ground with a hint of toast. Bright acidity with velvety tannins, follow a clean finish of mint, smoke, cedar and sweet plum. Next time you are on the North Fork make sure you taste through their portfolio and take a bottle of this home for that special dinner. This entry was posted in 2007, Clovis Point, Long Island. Bookmark the permalink. There is a benefit when you are under the radar. See you soon.